One of the books I am reading for my story about JFK and Inga Arvad is, seemingly aptly, titled “JFK: Reckless Youth.” The following is an excerpt not from that book but from another, “The Kennedy Men 1901-1963” by Laurence Leamer. Jack had apparently become so angry that he had rammed into this woman’s car a number of times. When he was called to account for his deplorable act, he lied, telling the officers that he’d “loaned my car out that night to some students.” Jack had given the police the name of one of these students – none other than his friend Lem. Now Lem was supposed to take the blame, saying “you’re sorry and realize you should not have done it.” Confession was good for the soul, even if it was a lie masquerading as honesty, as long as Jack did not have to take responsibility. Fortunately he didn’t have to drive that damaged old car much longer. 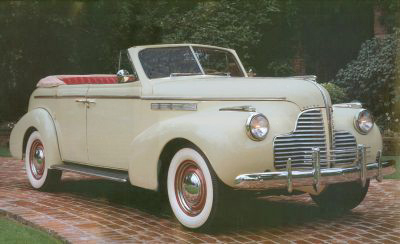 He bought a new one in 1940, a sweet-looking cactus green 1940 Buick Convertible, with red interior, in-dash AM radio and rear seat heaters, and a 107 HP engine to fly down those Long Island by-ways. A rabbi, a priest, and a protestant minister walk into a bar. Suddenly a fight breaks out among the other patrons, so the bartender calls the police. 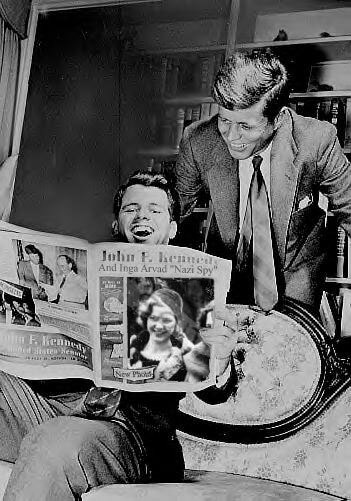 John F. Kennedy and brother Bobby laugh at the latest gossip in a Washington newspaper. They often fed stories to the Times-Herald and other papers through family, friends and associates who worked as journalists, like Kathleen “Kick” Kennedy, Page Huidekoper, Arthur Krock, Cissy Patterson and Clare Booth Luce. Somebody from behind the old iron curtain has been spamming my blog for a long time now, but recently I began receiving along with the usual canned Spam, jokes in Russian. – Мам, а кто мой папа? 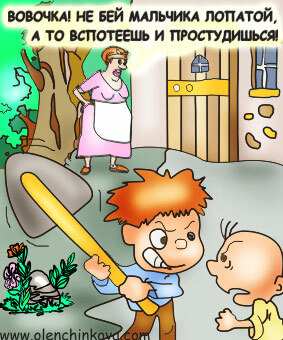 – Как это? – удивляется Вовочка. – Mama, who is my papa? – How is that? – exclaims little Vladimir. – Well, because…he came in the night, left a gift and nobody has seen him since. I love your book about John F. Kennedy and can’t put it down. I’m writing a story about Inga Arvad for my blog and in the course of my research I have hit upon several facts that I think may have been overlooked by you and other John F. Kennedy biographers. I dabble a bit with screenplays too, and I find Ms. Arvad to be thoroughly charming and quite an amazing woman really. I know if I had met such a woman at the same time in my life, I would have been deeply smitten for life. “Inga-Binga” may or may not have been an actual German spy, but she was surely well-connected and situated well enough to have caused the United States great damage, at a time when German U-boats were sinking our merchant ships practically within sight of shore and coming ashore with teams of saboteurs and agents at night. I am inclined by my great love for movies and my inherently romantic nature, to picture her as a somewhat reluctant or casual agent, sent here before the war, who found herself in more serious and dangerous straits after the attack on Pearl Harbor. Indeed in 1942 every factory and fixture was a potential target for saboteurs and every farmer with a pitch-fork and evidently every girl in or out of high-heels was looking for enemy agents. As an officer in Naval Intelligence, in charge of defending those very factories, I can’t help but wonder if John F. Kennedy was using or controlling her, and not the other way around. And if she were a spy, how frightening must it have been for her when the two teams of German saboteurs were executed in the electric chair that same year. Can you tell me if Ms. Arvad had any brothers or sisters who were still living in Denmark during the war? If any of her siblings had had similar political leanings as she did in early adulthood, they might surely have been recruited to work for the Nazis. For example, there were many Danes and other Scandinavians who served with units of the Waffen SS. I have read that the FBI thought at one point that she had an uncle who was a Berlin police chief, but that turned out to not be the case. Is it at least possible that Inga may have had relatives in the US and visited as a child with her aunt and uncle? I would like to know, because I found a record at Ellis Island of a family named Petersen who came to the US from Copenhagen via Liverpool, England in 1917 with a four year old girl named Inga, who stayed with a person named Marius Petersen in New Jersey. When JFK checked into the Chelsea Hospital in 1942 for his back he was treated by a noted physician Dr. Marius Smith-Petersen. Do you know if he was related in any way to Inga Maria Petersen, or can you say for certain that he was not? Do you know the origin, if there was one, of the phrase Inga-Binga? My sister thought that she had heard it used in a Bugs Bunny cartoon, and she was right, but that cartoon wasn’t made until 1950. Was Inga-Binga or Binga-Binga a common phrase during the war? So many of JFK’s relationships seem almost circular. For example JFK investigated the sinking of the Athenia for the American embassy, and at the same time Axel Wenner-Gren’s yacht was picking up survivors. Might Inga and her husband Paul Fejos have been on board the yacht? Might they all have met? Is that how Inga came to America? And I have read that Page Huidekoper, the woman who later accused Inga of being a German spy, worked for Joe Kennedy at the American embassy in Great Britain and later lived with Kathleen “Kick” Kennedy and/or Inga Arvad when they were both working at the Washington Times-Herald. And it was Page Huidekoper who got Kick Kennedy her job at the Herald, and Kick got Inga her job at the Herald, and Arthur Krock introduced them both to Cissy Patterson the owner, but Cissy was already close friends with Joe Kennedy who already knew Arthur Krock. 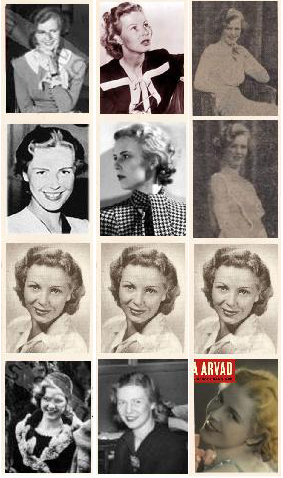 And last but not least, can you tell me why there are so few pictures of Inga Arvad, and if there are any archives that might still be holding copies of the Times-Herald that contain her “Have you seen [so and so]?” columns? Once in a while I read some writing that really hits home, or in this case that sums up in better words than I ever could, what I believe about the world, especially about America. The following excerpt is from a book I am reading titled “The Kennedy Men 1901 – 1963” by Laurence Leamer. “Joe was not much of a fighter himself, and he had not come here today to confront any of the boys who lived near Boston Common. His carriage moved on toward the townhouses and mansions spread along Commonwealth Avenue in the new Back Bay area and along Beacon Street. It was a world so different from the one below that it was as if life itself should have a different name here. So in a way it did. Here on these broad avenues the Protestant elite ruled over the space and grandeur of the city, over its elegance and art, and applied fine-sounding old English names to their streets and apartments. Clarendon. Exeter. Somerset. The names resonated like fine old crystal. When a servant answered the door, Joe politely stated his business and waited for the lady of the house to come to the door to try on her new hat. The elite ladies believed that they had nostrils of such refinement that they could catch the scent of an Irishman before they even saw him. They had as their guides not only their own servants but also half a century of magazine caricatures by Thomas Nast and others portraying Irish-Americans as quasi-apes, as looming, salivating simian wretches. Joe’s face at first glance showed nothing of what the ladies considered the crude excess of an Irishman’s features. The matrons could try on their hats with the pleasing knowledge that their bonnets had been touched not by a rough Irish hand but by the fine fingers of a young man who could have been their own son. These ladies were “New England Brahmins,” a term coined by one of their kind, Oliver Wendell Holmes. The hereditary aristocracy of the region fancied itself much like the Hindu religious caste: a natural elite, sanctified by an all-knowing God and a just social order. The Brahmin was, as Holmes wrote, “simply an Americanized Englishman. As the Englishman is the physical bully of the world, so the Bostonian is the aesthetic and intellectual bully of America.” Bullies they were, protecting their sacred precincts from loathsome pretenders who dared to dress themselves in the language and lingo that was not theirs, attempting to pass as one of their betters. The Brahmins had an almost perfect self-confidence. Nothing, no momentary fall in their economic well-being, no peasant races disembarking on their land, could move them off their high ground. The Boston upper class was largely without irony and had a blessed ability to forget what should best be forgotten. They tended not to focus on a past in which many of their ancestors had made fortunes in a three-sided trade that had slaves as one of its sides, or a present in which their coffers were enriched by the cheap labor of the immigrants they largely despised. They were proud that at their Somerset Club on Beacon Street no member would think of engaging in the disgusting practice of doing business in their social bastion, blissfully forgetting that they were such a close-knit elite that they could easily do their dealing elsewhere. These were a people of restraint who at times mistook manners for morals. The flowering of a distinctive, dominant New England literature and culture was largely over. The blossoms had fallen, leaving the thorns of reaction and regression in a people who had turned from history to genealogy, from literature to antiquarianism. The Brahmins were facing the melancholy mathematics of democracy: one foul Irish immigrant vote was worth as much as that of the most refined Brahmin gentleman. The Irish politicians would soon have the votes to take over the Brahmins’ city, and there was little the Protestant elite could do to prevent it. The Protestant upper class, however, did not simply slink into the night, carrying away the burden of their culture and their past. They were astute businessmen. They sat atop vast wealth that they continued to amass, dominating the economic life of New England. In their leisure hours they asserted themselves where a man’s vote did not matter, over the cultural and philanthropic life of the city.